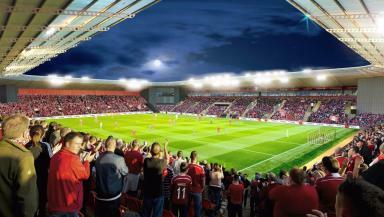 Campaigners are challenging planning permission for the 20,000-seater arena. 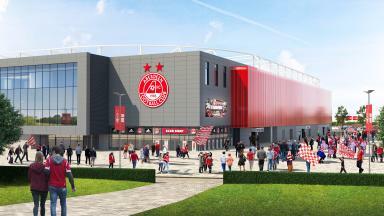 A legal challenge surrounding Aberdeen Football Club's plans to build a new stadium is under way at Scotland's top civil court. The No Kingsford Stadium (NKS) campaign group is opposed to Aberdeen's proposal for the £50m development around seven miles west of the city centre. Work is already under way on the project, which bosses say is creating and supporting local jobs. A judicial review hearing, brought by the NKS group, began at the Court of Session in Edinburgh on Tuesday. The substantive hearing, at which NKS is challenging Aberdeen City Council's decision to approve the plans, is scheduled to run for three days. Lord Tyre, the single judge hearing the case, is expected to deliver his decision at a later date. 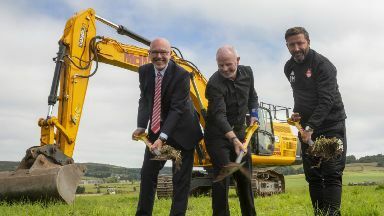 The legal challenge to the 20,000-seater development near the the A944 comes a year after councillors in the city overwhelmingly approved the plans. NKS said it has raised more than £100,000 from over 1000 individual donations to get to the stage of the court challenge. The group says it is working to protect the green space network and the environment of west Aberdeen. It is also critical of the distance between the Kingsford site and the city centre. In advance of the hearing, the group said: "The judicial review will bring impartial scrutiny of the decision made by Aberdeen City Council and whatever happens we can say we tried our utmost to stop this development. "Just look what can be achieved when communities pull together." Raymond Edgar, director of the stadium project, said: "Our proposal represents a £50m private investment in the region, which will benefit the club, the local community and the region overall. How the new stadium might look. "We are committed to contracting local companies in its construction and those appointed for phase one are already supporting and creating local jobs. "Work is well under way on phase one and will only stop if the courts find against the council following the hearing. "The hearing will only look at the process by which the planning application was granted and we are confident that due process was followed, allowing councillors to vote overwhelmingly to grant consent. "The hearing is an unwelcome distraction which is costing the club and the council, and therefore the tax payer, but we are hopeful of securing the right outcome." The council is not commenting while legal proceedings are ongoing.